"I am 6'9" and have yet to find official pants that don't hit me mid-ankle. Even the un-hemmed ones go to a 38" inseam when mine is 42". The shorts are almost obscene, but I've bought a pair of official pants, then cut and hemmed them to an appropriate shorts length. My shirt is somewhat loose/baggy, but it's the size that was long enough and I plan to have it tailored a bit when I can. The socks never fit either. Belt, neckerchief, and hat are all totally fine. What do you recommend for those who cannot find official clothing? Thanks!" Uniforms that fit can be a big/small problem for scouts and scouters on either end of the growth charts. 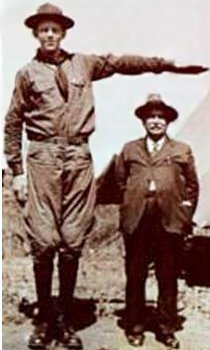 Fortunately, even the tallest scout had a uniform - it was custom tailored for Robert Wadlow around 1931. Robert was 7ft. 4in. when he was 13 years old and here he is in his uniform. I don't know if the BSA made Robert's uniform or not, but they're available to help you now. If the range of standard uniform sizes don't fit you, you can still be properly uniformed by contacting the BSA for a Made-to-Measure uniform. I've been told by the ScoutStuff folks that it takes about 12 weeks to receive a custom-made uniform, so plan ahead and Be Prepared! See this ScoutStuff.org page for their contact information.